Avery, Ellis. 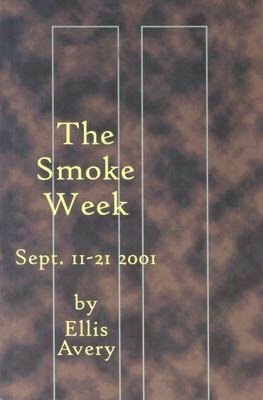 “The Smoke Week: Sept. 11-21, 2001”, Gival Press, 2003. A date that will live in infamy for all of us is 9/11/03 and it is one of those days that are etched into our memory and we shall live with it our entire lives. Some of us do not want to remember that day but that is impossible. Ellis Avery poignantly reminds us of that day and the week following by sharing her lyrical diary entries. Her writing is intimate and real and it pierces the heart. Avery is witness and testimony to that horrific week when we walked around with no sense of direction and for those of us who did not live in New York; we found it hard to imagine what it was like there. I am not sure that we need to be reminded of that time but if we are to be, then let it be in beautiful language. Ellis Avery is a thinker and filled with compassion and we feel her love for her city in every line of her writing. Captured in short poems, we feel what she felt during that horrible time and as she relates about the World Trade Center Towers, the heart breaks yet again. She sweetly shows us why we live and why we love others and our country and we are reminded that the most important and worthwhile things in life are consideration and kindness and the appreciation of other cultures and people. I was not sure that I wanted to read this, to be reminded but once I opened the covers I was compelled by the beauty of the language, something I also felt when I read Leslea Newman’s beautiful poems about Matthew Shepherd. We do not want to be reminded of pain we have experienced but we are drawn to it and it many cases it brings about a feeling of catharsis and that is a good thing. It is okay to weep over something horrific and it is something else to hold our heads high afterwards. While this is one woman’s experience of the horror, we all share it and what she gives us is a deep and sincere work. There is attention to detail that Avery gives to us as if what she is writing is happening as we read it. We are reminded that we are part of humanity and it is our responsibility to remain so. She reminds us of the human experience of that terrible day. She writes about the uncertainty we all felt as well as the sorrow and how small things that we took for granted before 9/11 became major issues. She writes about New Yorkers but in effect she writes about all of us. The media taught us how to remember this but no one, until now, even bothered to tell us to celebrate and commemorate what happened. She shows us how to put our memory in the right place and not to think that al will be fine but that it is possible to return to the way things one were. Despair and courage are closely linked just as loneliness and connection are. We smell and hear the sounds of New York City when it was filled with death and despair and are reminded that there were those who struggled to try to understand what happened and what should the response be. We get a perception that does not explain or sermonize—the perception is the witness to what happened. We still do not understand it all and I doubt we ever will. Even I who lived in Israel during some really terrible terrorist attacks am unable to understand but we must make peace with it and move forward. Avery gives us one person’s story but it is also a story of all of us. It is full of grace and style something that most of us aspire to. This entry was posted in GLBT poetry on September 3, 2012 by Amos.